(CNN) -- The face of 15-year-old Aziza says it all. Her mouth slightly agape, tears stream down her face as she glances around the inside of a helicopter with confusion in her eyes. She looks completely exhausted, overcome with emotion. She cries the whole flight to safety. 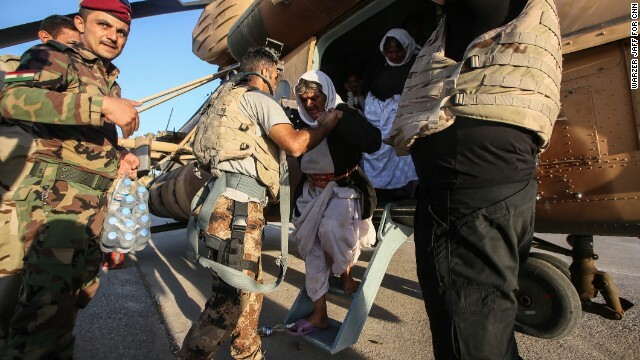 The Iraqi air force and fighters with the Kurdish peshmerga carried out a dramatic rescue mission Monday at Mount Sinjar, taking supplies to desperate Yazidis and ferrying a handful of people out, including Aziza. Teams hurled out bags and boxes of food from as high as 50 feet before approaching the ground. 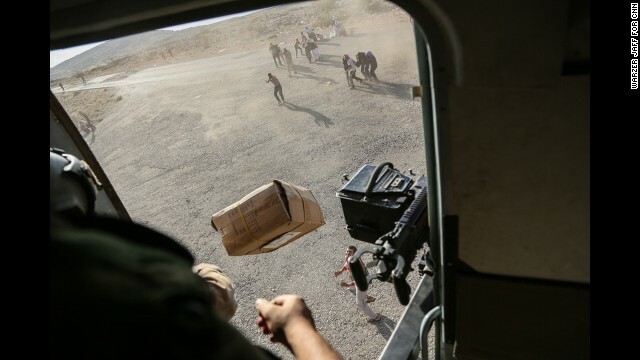 "We landed on several short occasions, and that's where -- amid this explosion of dust and chaos -- these desperate civilians came racing towards the helicopter, throwing their children on board the aircraft. The crew was just trying to pull up as many people as possible," Watson said. Soon, some of the trapped families -- including babies and the elderly -- were packed into the flight. A man held a water bottle for a woman trying drink, her head propped up on his shoulder. Others didn't make it and were left behind as the helicopter pulled away. 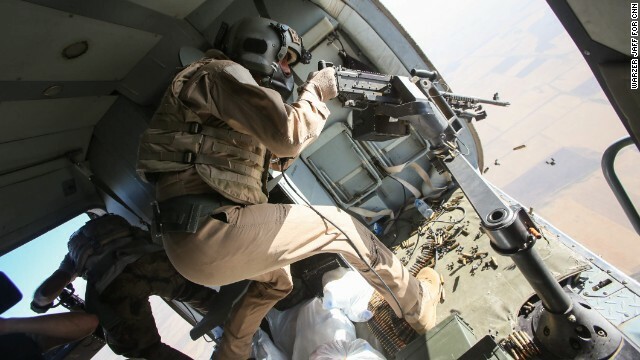 An Iraqi gunner opens fire at possible ISIS targets during a rescue operation by the Iraqi Air Force and Kurdish Peshmerga fighters on Monday, August 11. 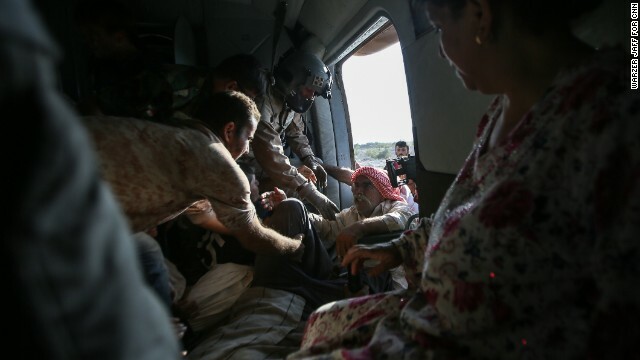 The dramatic operation at Iraq's Mount Sinjar involved taking supplies to desperate Yazidis and even bringing some aboard a helicopter to make it safely out of the area. A CNN crew was on the flight, which took diapers, milk, water and food to the site. Thousands of people have been fleeing from the militant group ISIS, which has taken over large swaths of northern and western Iraq as it seeks to create an Islamic caliphate that stretches from Syria into Iraq. 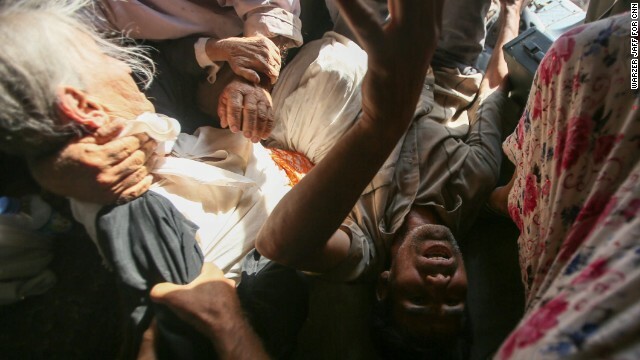 A couple dozen civilians were rescued during the operation. CNN's Ivan Watson, who was on the chopper, described the mission as "heroic." An elderly woman is put on the helicopter. 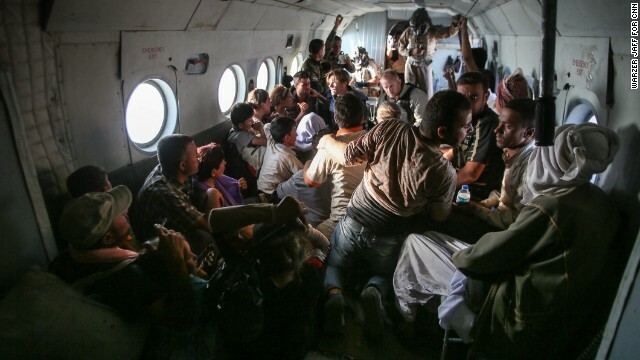 Yazidi people sit on the aircraft with members of the CNN crew. 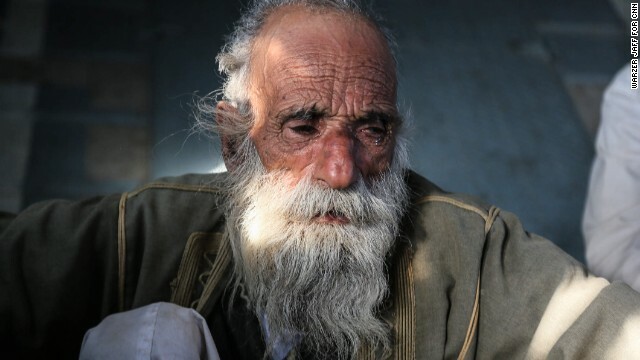 An elderly Yazidi man cries after he was rescued. A toddler named Helen sits in her mother's lap after being rescued. Rescued civilians sit on the helicopter. Yazidi people arrive safely to the Kurdish territory. "It was chaotic. It was crazy, but we were able to then lift off with about 20 civilians," Watson said. Yazidis, among Iraq's smallest minorities, are of Kurdish descent, and their religion is considered a pre-Islamic sect that draws from Christianity, Judaism and Zoroastrianism. One of the oldest religious communities in the world, they have long suffered persecution, with many Muslims referring to them as devil worshippers. More than a week ago, they fled into the surrounding mountains when ISIS fighters stormed the town of Sinjar. Now, trapped without food, water or medical care in the summer heat, thousands of families are in desperate need of help. 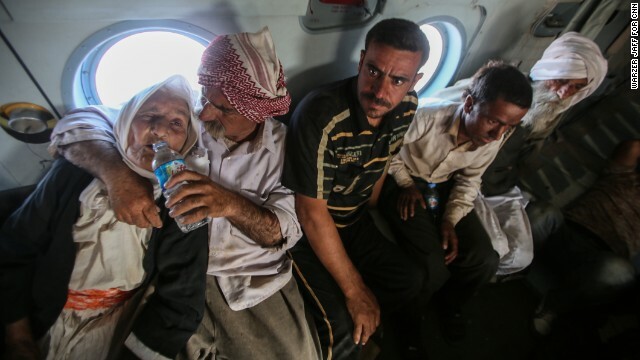 A senior Kurdish official warned Monday of the potential of genocide against the Yazidi people. Speaking to CNN's Watson, Fazil Mirani repeatedly called for a humanitarian intervention. 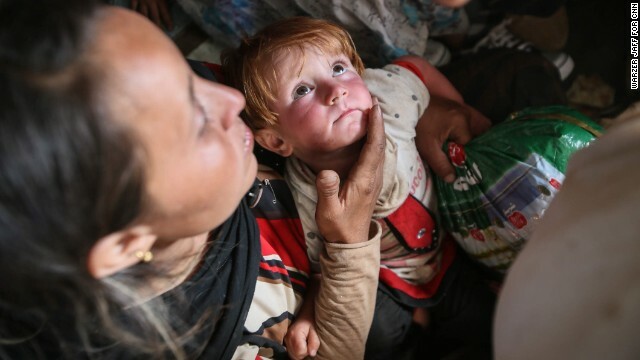 He estimated that as many as 70,000 people remain trapped on Mount Sinjar, and that at least 100 people have died so far from dehydration and the heat. CNN could not independently confirm those estimates. Who are the religious and ethnic groups under threat from ISIS? The United States on Monday conducted airstrikes on four ISIS checkpoints and "multiple" ISIS vehicles near Mount Sinjar, according to U.S. Central Command. "Our aircraft remain positioned to strike any terrorist forces around the mountain who threaten the safety of these families," President Barack Obama said the same day. "We're working with international partners to develop options to bring them to safety." Back on the helicopter, the relief of those already rescued was palpable. The crowd on board burst into tears as the chopper took off. Young and old, women and men, civilians and servicemen -- all cried with the intensity of the moment. Gunners had to open fire at the ground in order to make it away from ISIS. 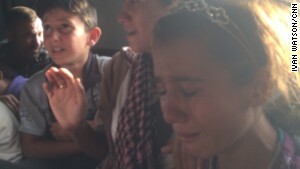 Who are the Yazidis? Why does ISIS want to kill them?